We waited a while before offering Afghanites on our web site. Ones we have seen before were either two expensive, not very esthetic, or a pale color. Finally we were able to locate the examples we were looking for: very esthetic, aerial crystals, intensely colored, perfect, and not too highly priced. 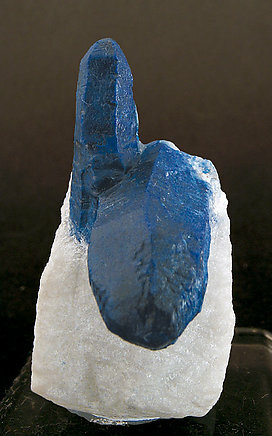 A definitive sample, with a large main crystal standing well out from the matrix and accompanied by another small crystal. It all stands out well from the white Calcite matrix. We waited a while before offering Afghanites on our web site. Ones we have seen before were either two expensive, not very esthetic, or a pale color. Finally we were able to locate the examples we were looking for: very esthetic, aerial crystals, intensely colored, perfect, and not too highly priced. 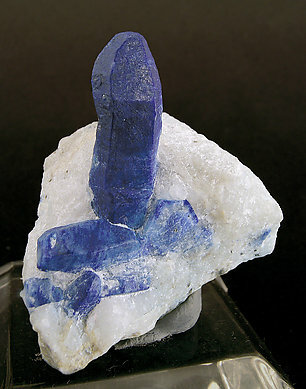 A definitive sample, with the main crystal well positioned on the white Calcite matrix.